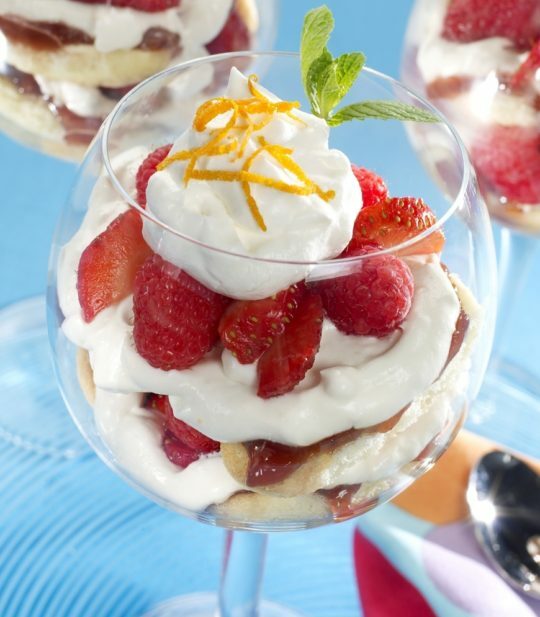 Try serving this fabulous favorite featuring berries laced with ladyfinger and raspberry jam with an orange cream cheese filling in individual glasses for another serving option. You may always substitute your favorite seasonal berry combination may be substituted. Recipe from Holly Clegg’s trim&TERRIFIC® Diabetic Cooking. In small bowl, mix together raspberry jam and orange liqueur. In mixing bowl, cream together cream cheese, sugar vanilla until light. Stir in orange rind. Mix in whipped topping reserving, 1/2 cup for topping. Line bottom of an oblong 2-quart dish with half of split ladyfingers. Layer with half of jam mixture, half cream cheese layer, top with half of raspberries and strawberries. Repeat layers with remaining ladyfingers, jam and cream cheese layer. Carefully top with thin layer of remaining whipped topping. Top with remaining raspberries and strawberries. Cover, refrigerate several hours or overnight. Terrific Tidbit: Instead of fresh orange zest, you can use dried orange peel, found in the spice aisle of the supermarket. The orange zest really enhances the orange flavor. Recipe from Holly Clegg’s trim&TERRIFIC® Diabetic Cooking.